Larry Sykes Jr., M.Div. student and pastor of Greater Good Hope Baptist Church, preaches during Southern Seminary's awards chapel service April 27. LOUISVILLE, Ky. (SBTS) — The comfort of Scripture and promises of God are necessary to sustain pastors through the trials of ministry, said Larry Sykes Jr., Clyde T. Francisco Preaching Award recipient, during an April 27 chapel service at The Southern Baptist Theological Seminary. Daniel S. Dumas, his wife Jane, and their two adopted sons, Aiden and Elijah. LOUISVILLE, Ky. (SBTS) — Kentucky Governor Matt Bevin announced May 3 the appointment of Daniel S. Dumas, senior vice president for institutional administration at The Southern Baptist Theological Seminary, to lead a transformation of the state’s adoption and foster care system, effective June 19. “There is no reason a child in Kentucky, who is ready to be adopted, should be without a family. We have to rethink the way we do foster care in this state, and Dan Dumas is just the visionary to help lead that charge. Dan is a servant leader, and his proven track record of excellence in innovation will help us cut through the red tape currently keeping 8,000 of Kentucky’s foster children from their forever families,” Bevin said. In his role at Southern Seminary since 2008, Dumas has led the institution’s strategic initiatives, building projects and renovations, and budget expansion. He has also taught Christian leadership courses and written or edited several books, including Live Smart and Guide to Biblical Manhood. “Dan Dumas has made an invaluable contribution to Southern Seminary as senior vice president for Institutional Administration. I am thankful for his decade of service and for his commitment to our mission,” said Southern Seminary President R. Albert Mohler Jr.
“Dan is a great leader, and he has a tremendous heart for service and ministry. He will be greatly missed in this key leadership capacity at Southern Seminary. I congratulate both Governor Bevin and Dan Dumas on this announcement,” Mohler said. Despite inclement weather, 400 volunteers from The Southern Baptist Theological Seminary and Boyce College participated in the fifth annual 1937 Project, April 22. The event commemorates the school’s relief efforts in the Great Flood of 1937, when the Ohio River rose to more than 50 feet, creating one of the worst floods in American history. 10-year-old Jennifer, daughter of SBTS marketing director Laurie Taylor, rakes leaves as part of the Shawnee Neighborhood Cleanup. According to Southern Seminary’s Student Life Office, volunteers logged about 1,200 community engagement hours throughout the city, including projects at Scarlet Hope, Oxmoor Lodge Retirement Home, Louisville Rescue Mission, Keystone Learning Academy, and Portland Promise Center. The mayor’s office assigned the seminary community to two specific projects — Smoketown Neighborhood Cleanup and Shawnee Neighborhood Cleanup — where about 300 people disbursed to pick up trash and share the love of Christ with residents. As part of the cleanup in the Shawnee neighborhood, Boyce professor Kevin Jones led a group to work on a century-old church building that recently became the home of No More Limits Church, pastored by Emery Scott Lee. Affected by water damage and years of vandalism, the church was almost “completely destroyed,” Jones said. Despite the damage, Lee still had hope. Pastor Lee’s “vision is that the church will become a beacon of light in the Shawnee neighborhood. His hope is that his church will be a place where the gospel will be fully displayed,” Jones said. The 1937 Project joins with Mayor Greg Fischer’s Give A Day week of service. Fischer spoke to volunteers during the morning rally before they were sent out to various project sites. The mayor encouraged volunteers and remarked how Southern Seminary has been essential to accomplishing his plans for making Louisville a compassionate city. “In all the craziness of the weather that morning, Mayor Greg Fischer expressed privately how shocked he was at the incredible turnout,” Pierre wrote. The 1937 Project was part of Southern Seminary’s first ever Giving Days, a four-day initiative April 20-23 aimed at supporting the mission of the institution providing students, alumni, donors, and faculty the opportunity to tell their stories, support the institution financially, and serve the community of Louisville. 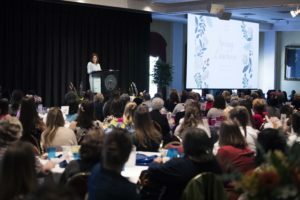 Glenna Bevin, Kentucky's first lady, speaks at the April 24 Woman's Auxiliary luncheon on her passion for adoption and foster care. LOUISVILLE, Ky. (SBTS) — Kentucky First Lady Glenna Bevin urged 300 attendees during an April 24 Woman’s Auxiliary luncheon at The Southern Baptist Theological Seminary to step out of their comfort zones and get involved with foster care and adoption. Glenna and her husband, Kentucky Gov. Matt Bevin, have adopted four children from Ethiopia and have pledged to improve the state’s foster care system. Evangelical Christians must not compromise the gospel when cooperating with Catholics on social and political matters, said R. Albert Mohler Jr., president of The Southern Baptist Theological Seminary, at The Gospel Coalition National Conference on the Protestant Reformation. R. Albert Mohler Jr., president of The Southern Baptist Theological Seminary, speaks at a workshop during The Gospel Coalition National Conference, April 4. Evangelicals partnering with other groups in shared matters of social concern is often necessary — such as with Catholics in the pro-life movement — but should never eclipse the importance of doctrinal differences between the two. Southern Baptist Convention President Steve Gaines preaching on the priority of prayer at The Southern Baptist Theological Seminary’s April 11 chapel service. Southern Baptists should prioritize prayer for unity and evangelism, said Southern Baptist Convention President Steve Gaines at The Southern Baptist Theological Seminary’s April 11 chapel service. “I’m praying that the priority of the Southern Baptist Convention [is] that we will become literally a house of prayer. I’m praying that when people think about the Southern Baptist Convention the very first thing they will think of is this: That’s the group of folks, those are the folks that pray,” Gaines said. Examining the method of the early church, Gaines explained 10 truths about the importance of prayer from Acts 4:23-31. Gaines said the early church provides an example of how prayer reveals the intimacy of a Christian’s relationship to God. People talk with and about those whom they love, and prayer is one way Christians talk with God, he said. The book of Acts is about people praying to God and sharing Scripture with others. Southern Seminary President R. Albert Mohler Jr. speaks at the plenary session of the Board of Trustees, April 10. LOUISVILLE, Ky. (SBTS) — Young Christians are called to be “salt and light” and share the gospel where God has placed them, said Southern Baptist leaders during Boyce College’s Renown Conference, March 17-18. “You don’t have to have a Bible college or seminary degree to get this understanding that Jesus has put me in the place he has me; he said, ‘Go home to be salt and light,’” said Eric Geiger, author and vice president of LifeWay Christian Resources. Jim Richards, executive-director of the Southern Baptist of Texas Convention, preaches on Ecclesiastes 4:9-12 in a March 21 chapel service at Southern Seminary. Southern Baptists need to unite in order “to advance the kingdom of God together for God’s glory,” said Texas Baptist leader Jim Richards during The Southern Baptist Theological Seminary’s March 21 chapel service. “What we have [as churches in the Southern Baptist Convention] is definitely much more in common than we have apart. And our heart and our soul is that we are to be together,” said Richards, executive-director of the Southern Baptist of Texas Convention. Preaching from Ecclesiastes 4:9-12, Richards’ sermon focused on how Southern Baptists can work together. Church cooperation through associations and conventions created efforts to train ministers and support feeble churches, he said. The Southern Baptist Convention’s Cooperative Program supports worldwide missionary efforts and promotes doctrinal accountability. Southern Seminary students visited Dearborn, Michigan, home of the largest concentration of Arab-Americans in the United States, to pray for and evangelize local Muslims, Feb. 24-26. Led by Ayman S. Ibrahim — Bill and Connie Jenkins Professor of Islamic Studies and director of the Jenkins Center for the Christian Understanding of Islam — the team interacted with a few of the more than 100,000 Arab Americans who comprise at least 45 percent of Dearborn’s population. M.Div. student Josh Hildebrand, center, reads from the Gospel of John with two Arab-American men, right, at a local bakery in Dearborn, Michigan. The 13 students from Southern and Boyce College visited local Arab bakeries and restaurants, starting conversations with Muslims and discussing the Christian faith. The team also visited the Islamic Center of America, which was one of the largest mosques in the United States when it was built in 2005. Several students received the contact information for Dearborn residents they met during the trip with the intention to have follow-up conversations about the gospel.